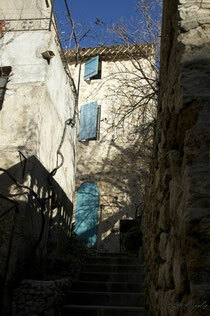 Exciting things are happening in Vauvenargues these days. Nestled snugly at the foot of the Sainte Victoire mountain, east of Aix-en-Provence, the villagers are preparing themselves for an inundation starting Monday, 25 May, 2009. …but read on for exciting new developments for 2010! 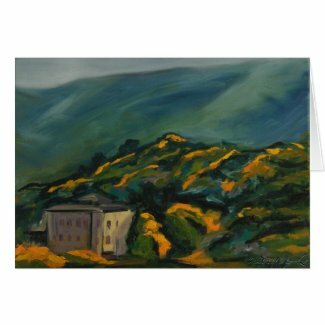 In 1959, Pablo Picasso announced that he’d purchased Cézanne’s Sainte Victoire—le veritable—and despite the flood of visitors during the three years he inhabited the château, life goes on as ever on this sunny hillside. The community website has been updated, and it’s never looked better. Depending on the level of your French, you can learn everything you need to know about visiting, staying, and moving in. Le samedi 4 avril et le dimanche 5 avril 2009. Le samedi 11 avril et le dimanche 12 avril 2009. - suivi d'une pré ouverture pour les scolaires : deux classes par demi journée. Two classes of school students get to spend a half-day! …wait, that's 2 classes within each half-day. Okay, that makes more sense. Don't you get tired after all that commotion? It's an overdose of LIFE, almost. 2) Ouverture :- 25 mai au 27 septembre : période de l’exposition au musée Granet. - Ouverture du château pour les groupes et individuels. 3) Post ouverture : - 5 octobre au 15 novembre : prolongation scolaires, public local et régional. Post-opening—which seems like an anomaly—special visits for schools and local, regional…it’s who you know…. Pendant la période de l’exposition : visites : 7 jours sur 7 de 9h à 19 h.
Wow, look at that, it’s going to be a busy place this summer. WWPD? 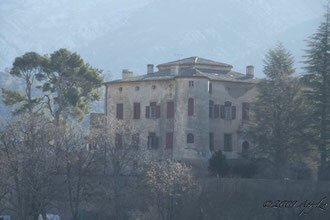 Access to the CHÂTEAU is by Reservation only through the Granet museum or the Aix-en-Provence tourist office. Tickets went on sale on the 12th of January, and we locals got in there fast! Good luck, if you’ve not already gotten your tickets. Ironically, your ticket includes an obligatory shuttle bus ride for access to the château. So, if you live closer to Vauvenargues than you do to the parking at Trois Bons Dieux… but I digress. The shuttle will deliver you to the west side of the village if you’d rather walk a little farther but take in the sights, and maybe shop at the Spar; or to the east parking, which is a shorter walk and an impressive close-up view of the château. YOU HAVE TO TAKE THE SHUTTLE OR ELSE! They repeat! It’s INCONTOURNABLE —which is a word hardly worth translating; it stands for itself! -The potential daily maximum of visitors is (at 36 people/hour) 340 bodies. 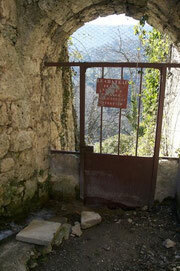 -If you’re not inscribed on the register, you will be denied right of entry into the château. -Cause any problems, and you’ll simply be booted right out from whence you came. -Vehicular access to the village will be regulated like a DMZ. 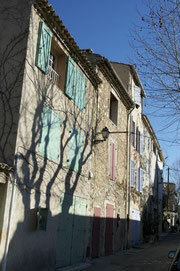 During the Middle ages, this was declared a fiefdom by the Archevêques of Aix. The Castrum du Sambus (on the Rte de Jouques) was fortified in the 14th century and granted to King Réné. Ruins remain at the summit. Le Castrum de Guerre, on the plateau of l'Hôte, was constructed in 1379. It contained a fort inside defensive walls for the refuge of the population in time of war. Ruined in the 15th century, it is still somewhat evident below the farm. Most of the rocks have been reused for local sheep & goat-herders’ enclosures. 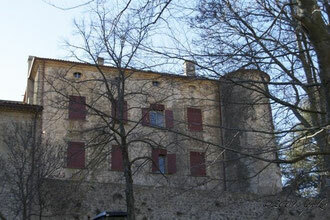 Le Château was a Roman stucture with an animal enclosure, located on a gorge by the river La Cose. At that time, there was a grand hall, called ‘le Réduit,’ with walls 2-3 meters thick. It belonged to the Counts of Provence, and the Archevêques d’Aix starting in 1257. The Clapier family occupied the château until 1725, at which time the fiefdom with given to the marquis for his services rendered during the plague. Between 1790 and 1943, le château belonged to the Isoard family. 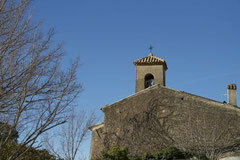 It was purchased by Picasso in 1958, and he was buried there 1973. Financial stronghold, then religious domain, followed by royal castle, this edifice dates to the 14th century. Several walls from this period remain, including the two fortified keeps on the eastern side—and I could tell you more about them if I knew what ‹‹carrées crénelées à machicoulis›› are. Ruined in the 15th century, the château was reconstructed by par François de Clapiers in 1560. He made it more massive, imposing and isolated; squared it with round towers on the west side, and added the Grand Entrance door. Note that the emblem over the door is that of the Isoard family. The château was again restored in 1644: and the website continues with many extraordinary details that I look forward to seeing for myself in the very near future….And that will be for another blog…. Have been, and more impressed than I expected to be. I wasn't allowed to take photos, but that didn't stop me from sketching like a court reporter on after a Starbucks jumpstart. 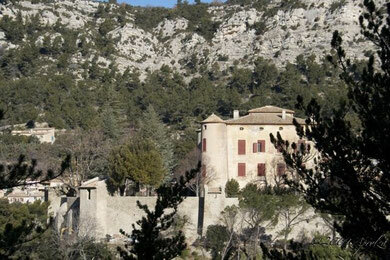 The Association du Château de Vauvenargues created a beautiful and easy-to-use website that even has a bit of the history in English. What's lacking is a French translation of Reservation information…which, I suppose if you don't understand French, then you'll miss a fair bit of the interesting commentary during the tour. The Château is open for tours 30 june - 2 october, 2010. Click on the photo (or here) to reserve online. Cost: €8 for adults, children under 7yrs are free. Tours are 10am, 11am, 2pm, 3pm, 4pm, 5pm. Closed Monday and Tuesday. The tour lasts one hour, and includes a number of stairways. Maximum number of visitors per hour: 18. All visitors must be accompanied by the obligatory guide. Individuals may reserve no more than 6 places at a time. Confusion about access to the Château? There is an hourly shuttle service from les 3 Bons Dieux just outside of Aix on the D-10. 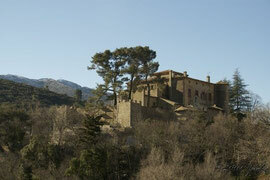 Individual cars may park outside the village of Vauvenargues, and walk the 10 minutes to arrive at the Château.